Co. Cork: Aglish, Aghinagh, Aghabullogue (2), Ballyvournay (2), Cannavee, Clondrohid (2), Donaghmore (2), Inchageela or Eveleary (2), Kilcorney, Kilnamartyr, Macloneigh, Macroom (4), Magowney, Matehy, Milmurry (2), Ovens. The Board also included 8 ex-officio Guardians, making a total of 33. The Guardians met on alternate Saturdays. The population falling within the Union at the 1831 census had been 53,166 with divisions ranging in size from Macloneigh (population 1,520) to Macroom itself (5,353). The new Macroom Union workhouse was erected in 1841-2 on a six-acre site at the north side of New Street to the west of Macroom. Designed by the Poor Law Commissioners' architect George Wilkinson, the building was based on one of his standard plans to accommodate 600 inmates. Its construction cost £8,359 plus £1,010 for fittings etc. The workhouse was declared fit for the reception of paupers on 1st October 1842, and received its first admissions on 13th May 1843. The site location and layout are shown on the 1904 OS map below. The buildings followed Wilkinson's typical layout. An entrance and administrative block at the east contained a porter's room and waiting room at the centre with the Guardians' board room on the first floor above. During the famine in the mid-1840s, a store was hired to accommodate 60 extra inmates. A forty-bed fever hospital and a mortuary were erected at the north-west of the workhouse. The workhouse had its own burial ground at the west of the site. In May 1921, forty armed civilians attacked and burnt down the workhouse, after first removing the inmates to the infirmary. At about the same time a convoy of police was ambushed six miles west of Macroom with machine-guns being used by the rebels. This attack was evidently cover for the incendiarism. 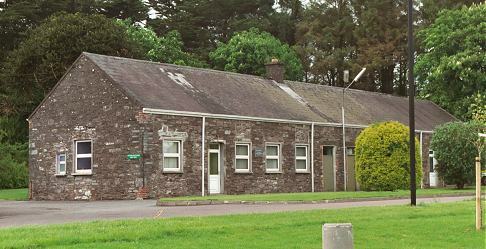 The former workhouse site is now the home of Macroom Community Hospital. Cork City and County Archives, 33a Great William O'Brien Street, Blackpool, Cork. Holdings include: Board of Guardian Minute Books (1884-1924); Indoor Relief Register (1916-21); etc.